Marissa Mayer went on the Today Show this morning to introduce Yahoo’s redesigned homepage and mobile sites. the ads leave a lot to be desired.They’re blurry. 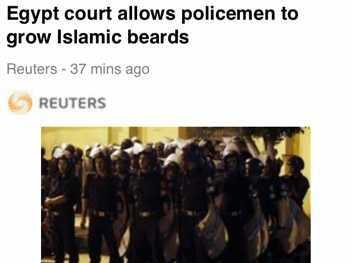 If you look at the ad to the right, which was a banner above a story, you’ll notice that while the text is a little blurry the company name (under the green text bubble) is illegible. That’s going to be a big problem for advertisers. At the moment, there aren’t many mobile ads propagating the site. 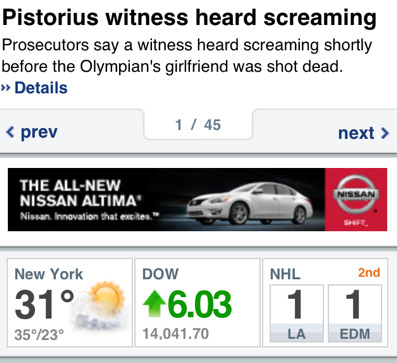 Those that are on the Yahoo’s mobile page usually appear on the top or bottom of a story. But almost all of the ads I saw had a similar problem. 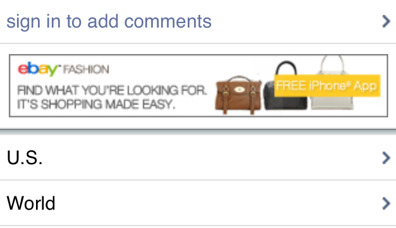 And, once again, the name of the advertiser that actually bought this banner ad (it looks like LowerMyBills.com) is almost impossible to read. And getting the advertiser’s name out there is arguably the most important part of an ad. 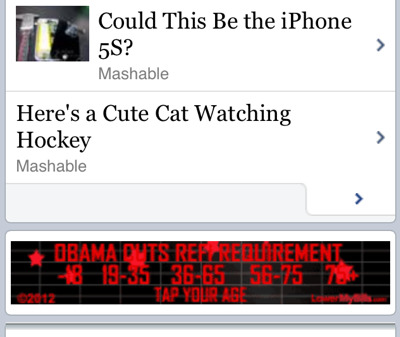 Ad Age noticed the issue as well with an eBay ad that also appeared on one of the stories I clicked on. The colour contrast doesn’t work when the white letters are blurred. While one expects some initial kinks in a newly relaunched site — and mobile banner ads aren’t known for being attractive — this is noteworthy considering the emphasis Mayer has put on the mobile experience. On the Today Show, Mayer told Savannah Guthrie that part of Yahoo’s new strategy was “capitalising on the trend towards mobile.” There are 200 million users on Yahoo’s mobile site every month, after all. Mayer has also discussed the importance of creating non-intrusive ads that are personalised to users. actually adds value to the end user and that it actually enhances the experience,” she told Bloomberg TV from Davos.But from an advertiser and user’s perspective, the current ad display leaves something to be desired. Of course, this could just be an overarching design issue. When looking at Reuters’ logo (right), the lettering read kind of blurry as well. 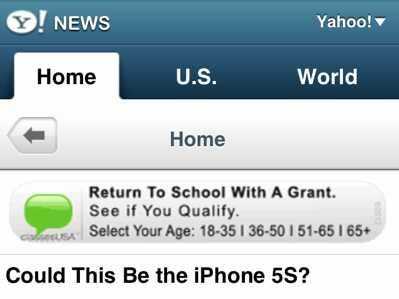 advertising advertising-us madison avenue mobile ads yahoo!